This one may look like your traditional 2203 Master Volume head but it is in fact the last incarnation of the Marshall Superbass. While the first models use to be very close to the 1959 Superlead models, they evolved during the seventies to include a lower gain preamp and a baxandall tone circuit. This particular model employs this design with the added benefit of a semi parametric mids control and a “slope” control to dip the mids. Its tone is fairly flat and dark with a medium content that’s stronger than most bass amps. The “slope” control isn’t particularly progressive or effective and the 100W power rating may not be enough in some contexts. The result isn’t too bad for bass but the strong competition of the eighties in the bass amp camp meant the end of the Superbass range when the JCM900 models arrived on the market. Apart from the VBA400, Marshall hasn’t put out a powerful and straightforward valve bass amp since then. Maybe its time they did? 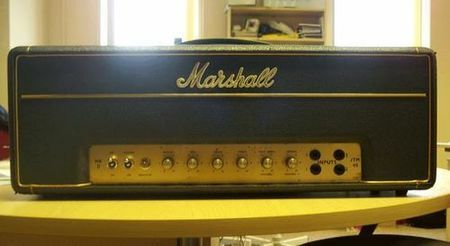 This 1962 is part of the Marshall reissue from the 90's. While the accuracy of these reissues has been largely debated, this amp does sound pretty good and is very well built with chassis-mounted valve-bases and high quality pots. As with the original, the cabinet is too shallow to allow the bass end to develop properly. 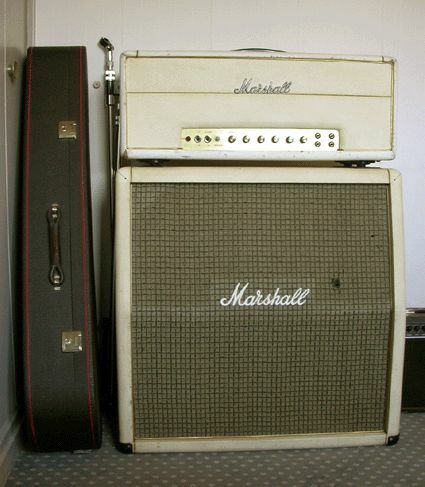 Therefore, it pays to connect the amp to an additional 4x12 if you seek real low end grunt but if the amp is mainly used for lead, then its bottom end is largely sufficient. For a good crunch levels, the 1962 needs to be pushed and it then rewards you with a fluid forgiving tone due to the compression induced by the rectifier valve. This particular Bluesbreaker needed some TLC as it had been previously repaired by an unqualified and unnamed technician. It also needed new power valves as the original 5881 had long worn off. 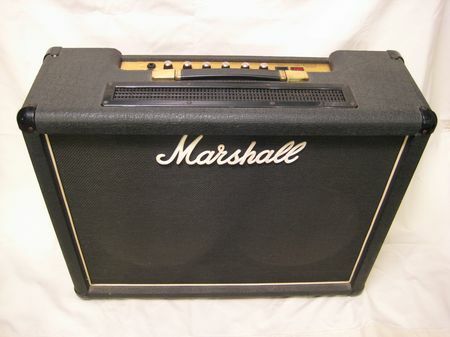 These were replaced by a more appropriate model than the Marshall preference of the nineties. Due to an inappropriate lead dress, the tremolo creates a small buzz when a footswitch is connected and it is switched off but it is a small price to pay for a great rocking tone. 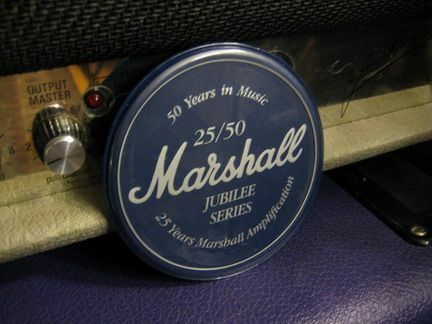 This very niceMarshall JTM45's picture was actually taken in my Line 6 office. It belongs to Geoff, one of the owners of the great Live Music Shop in Peterborough.. It stopped working and was diagnosed with a dead output tranformer by a local tech. Geoff did the right choice in trusting me with the repair. In fact the transformer was in a perfect shape and I got it running pretty fast. Unfortunately, the amp had been sent some years before to Marshall UK who actually replaced all the jacks with JCM900 types ones. Now here is a painfull heresy. But it is fair to say that the word vintage didn't mean the same thing as it does today. Eagle-eyed ampaholics will have spotted the white back panel indicating that this is a transition model. This is my 1959 Super Lead. This was my very first real valve amp, and it is also the bet looking one. I played it for several years in my first bands but I have retired it because I can't bring myself to expose it to a drunken audience or traditional road abuse. This very good looking Superbass 1992N from the end of the 70s had a blown power transformer due to a previous owner. I replaced it with a nice high quality german replacement and sold it to Geoffrey from El Gato. 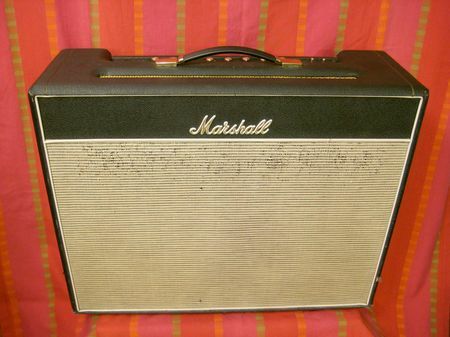 Its design is actually unusual to Marshall standards, with a Baxandall tone circuit. The bass with this amp is quite incredible: I shouldn't have sold it. 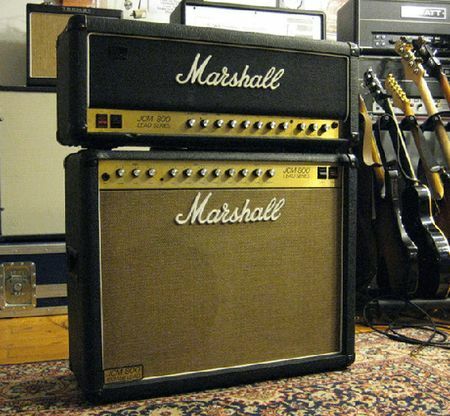 Speaking of Marshall, here is nice 2104, the combo equivalent to the 2204 in JMP styling. 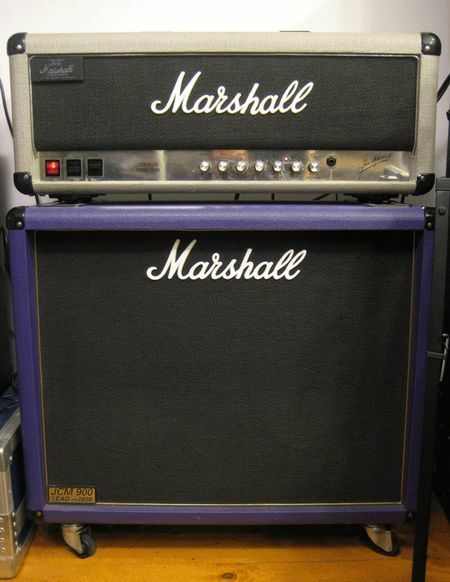 It is equipped with two Celestions G12 65 with a big Marshall sticker. These speakers do sound good, but not at low volume: you really need to push them to avoid any harshness. The output stage had no snubber resistors or grid-stoppers. It worked fine with the original valves but squaeled like a pig with any newer valves. Like pretty much all 2203 style amps, it was also way too bright and I implemented a few of my mods to correct that while keeping the original character of the amp. 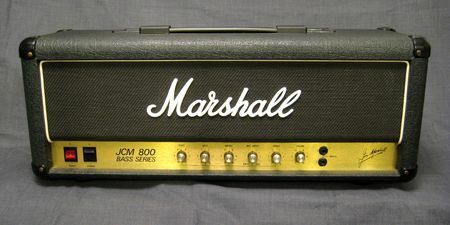 The Marshall JCM 800 2210 and its brothers were Marshall's flagships for the best part of the 80s. Although they had plenty of great features for the time, in hindsight, their tone and performance are actually not that great. These two belong to Loran from Toxic Waste and came in for a check up and a much needed valve change. There have been two different versions of the 2210, with similar cosmetics but different channels designs. These two are from the second generation and therefore electronically identical on paper. In reality, their layouts are very different: the combo's is clean and logical, while the head's is untidy (but original). As a consequence, the combo is very quiet while the head buzzes when the gain knob is maxed on the crunch channel. The dual channel JCM800s are good amps if you are playing loud 80's French punk rock or Warrant type hard-rock. Apart from that, and if you are looking for a good tone, forget about them. Who said older was better? 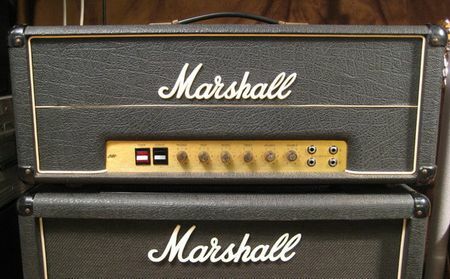 Ok, so everyine knows now about the fabled Marshall Silver Jubilee amps, used by Slash of the Guns and Roses, but also by John Frusciante, Iggy Pop, or the Black Crowes. Anyway, I believe that it goes very nicely with this Marshall 1936 cab in purple tolex that I bought from my friend Luke who was managing the Live Music Shop in Peterborough at the time. Custom colored Marshall are not unusual but this cab has the rarer gold piping of the 30th Anniversary series. That makes it the only one in the world with this color combination. It has been a long time since I have had a Superlead (model 1959) on my bench and this one is a nice example. During the first half of the 70s, this amp pretty much defined the Rock toneand there are still plenty of them in the UK and Europe. About 10 years ago, music shops couldn't sell their second hand 1959 for £250 and they were literaly stacking them up. These days, Superlead command higher prices but they are nevertheless seldom used onstage due to their overly sensitive volume controls and awesome power: they can go from whisper quiet to excruciatingly loud just by looking at the volume pot. This was exactly the problem of this 1976 Superlead belonging to Seb from the Nelly Olson band. As a consequence, it almost had never been used since the beginning of the 80s and Seb wanted to add a master volume. It is not uncommon for hackers to put a volume control in the place of one of the inputs or worse, drill a new hole in the front panel. Devalue such a great amp this way is at best stupid, especially when there are much more elegant and efficient solutions. I modified this head by turning one of the volume controls into a master volume, and adapting the second one so that it controls both channels simultaneously. The amp is cosmetically untouched and each channel's circuit remains original. It is still possible to use them separately or combine them for a more balanced tone. The 1959 always gives its best at high volumes but thanks to this master volume design, the unmistakeable Superlead tone is obtained while the audience audition is spared. Here's another emblematic model from good ol'Jim, although maybe not in its most famous outfit. 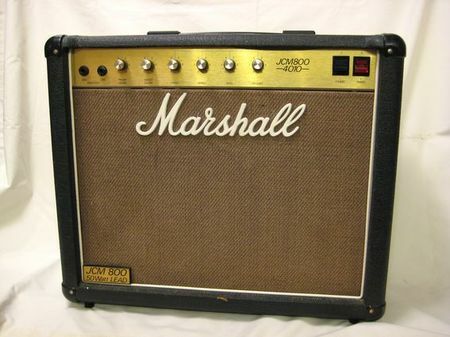 The Marshall 4010 is the 1x12 combo version of the 2204 (which is the 50W version of the legendary 2203). A new set of valves and a good overhaul made a Rock'n Roll monster out of this baby. The ultra-compact 1x12 format doesn't allow to get the best out of this amp wether it is fitted with a Celestion G12T75, a G12M70 or a G12-65 (depending on production date): the tones are narrow focused and the highs are a bit too aggressive. Nevertheless, it is a very convenient package and one only has to plug a 4x12 into the spare speaker socket at the back to get the best out of the 4010: it gives one of the greatest tones for classic rock and metal.